What are some fun things to do in the SF Bay Area this Christmas? You will find everything from shows to tree lighting ceremonies to holiday craft fairs. Other options include Cirque du Soleil, several performances of the Nutcracker Ballet, and lots of places to go ice skating outdoors. My insider's guide offers tips throughout the holiday season as well as specific ideas for Christmas Eve and Day. You will also find some great restaurant recommendations for the holidays here too. You will find the best activities in San Francisco, Oakland, San Jose, Marin and other places through the Bay Area. Click the links below to jump ahead to a specific section with the best things to do this SF Bay Area Christmas season! Spend a night with the SF Ballet as they perform the classic holiday ballet, The Nutcracker. The SF Ballet was the first company to perform it in the US and it's a must see! Tickets for this show are in high demand, so make sure to pick up your tickets early. Here is a little more about the performance. The show starts with Uncle Drosselmeyer making his famous toys and a very special nutcracker doll. As the Stahlbaum family is lighting their Christmas tree, Uncle Drosselmeyer arrives with his toys. These toys include a jack-in-the-box, a life-sized ballerina, and the magical nutcracker. Later that night, Clara falls asleep and the nutcracker doll comes to life and protects her with his toy soldiers against the King of the Mice and his army. As the Prince tells of his battle, the Sugar Plum fairy has a festival to honor them. As the dream ends, Clara becomes a ballerina so she can dance with her prince in her dream. As she awakes, she find the nutcracker doll has been repaired and she is safely cuddling it. Runtime of 2 hours with a 20 minutes intermission at the San Francisco War Memorial Opera House. This ballet is family friendly. Here are tickets for all performances this season. In addition to the San Francisco Ballet's performance, you will find a variety of other performances of the Nutcracker all around the SF Bay. Here are just a few of my top picks. Oakland Ballet Company (12/11 - 12/23): Graham Lustig's version of The Nutcracker is performed by the Oakland Ballet Company in this 2 hour presentation. It is known for the outstanding dancing, costumes, and the sets that will make your holiday joyous. This performance takes place at the Paramount Theater in downtown Oakland in the SF Bay Area. Find tickets for a handful of show at a discount on Goldstar. SF Youth Ballet (12/1 - 12/2): This version of the Nutcracker showcases the youth ballet and also other bay area dancers who still enthrall and excite any audience. This 2-hour production is family friendly and a great introduction for children of all ages to this wonderful holiday experience. The SF Youth Ballet Nutcracker runs 2 hours at the Mercy High School Theatre at this Christmas show in San Francisco. Find tickets at a discount on Goldstar. Peninsula Ballet Theatre in Redwood City (12/22 - 12/29: Performed at the Fox Theatre in Redwood City, this version runs for two hours with an intermission. This show also allows audience members to go on-stage and meet the dancers following each performance. Discounted tickets to several shows. San Jose (12/8 - 12/15): Another south bay presentation of The Nutcracker is located at the San Jose Center for the Performing Arts in San Jose. Many special guests, including some from the Dance Theatre of Harlem, the Syracuse City Ballet, and the Estonian Theatre Vaneumuine Ballet, star in this wonderful version of this holiday ballet. Tickets for most performances at a discount on Goldstar. The mesmerizing Cirque du Soleil returns to The Big Top at Oracle Park (formerly AT&T Park) this holiday season. This show includes incredible stunts, high-flying acrobatics, incredible designs and more that are sure to amaze. Volta presents the story of Waz, a gameshow contestant who is trying to find freedom and figure out who he really is and can be. He knows that something is missing in his life and hopes that finding fame and fortune will make him happy. However, the real question is whether the path to being the incredible person Waz can be is outside or inside himself. Follow along with Waz and be amazed by events such as extreme BMX cycling, shape diving, the acrobatic ladder, and much more during this incredible Christmas time event. Here are tickets to just a few of the shows during the SF Bay Area Christmas season. San Francisco's acclaimed A.C.T. brings to life this wonderful Charles Dickens' tale of the misery Ebenezer Scrooge, a grumpy lonely man who is visited by 4 ghosts on Christmas Eve. Scrooge sees his past, his present, and his future during the visits by the ghosts. It is up to him to decide whether he wants to change his way and become a better person, or stay the bah-humbug person he is now. A Christmas Carol is performed at the American Conservatory Theater in San Francisco. San Jose (12/5 - 12/24): Spend an evening with the Northside Theatre Company and their 36th annual showing of A Christmas Carol. All shows are at the Olinder Theatre in San Jose. Find tickets at a discount on Goldstar. Foster City (11/29 - 12/16): The Hillbarn Theatre in Foster City is where you will find another A Christmas Carol performance. Shows run from November 29 - December 16. Find tickets at a discount on Goldstar. Walnut Creek (12/6 - 12/16): Located in the East Bay city of Walnut Creek, Center REP's version of A Christmas Carol is a treat for children of all ages. Performed at the Lesher Center for the Arts' Hofmann Theater. Tickets for all shows. You will find a variety of wonderful shows throughout the SF Bay Area this Christmas. Here are a few of my top picks this season. Vanessa Williams, Holiday Soul with the SF Symphony (12/7 & 12/8): The always incredible Vanessa Williams, star of screen and song, performs with the Oakland Interfaith Gospel Choir this holiday season. Ms. Williams ability to incorporate jazz, soul, and R&B into classic Christmas songs will have you singing along and tapping your toes during this must see performance. This one day event is at the Davies Symphony Hall in San Francisco. Find tickets to both performances. The Velveteen Rabbit (11/2 - 12/8): Local dance company ODC brings to life this wonderful tale about a little boy who is given a toy rabbit. The rabbit doll wants to be a rabbit in real life, but this is only possible by being the boys favorite toy. Luckily for the rabbit, the boy loves him and a fairy allows the Velveteen rabbit to become a real rabbit who lives in the forest. This family friendly show is performed at the Yerba Buena Center for the Arts Theater in San Francisco. Smuin's The Christmas Ballet (12/13 - 12/24): This nontraditional holiday presentation will give you dancing clad in all white outfits as they glide on stage to jazz, funk during the first act. The second part of this 2-hour presentation includes the red-clad dancers moving to cool tunes like "White Christmas", "Baby, It's Cold Outside","Santa Baby", and other favorites. Make sure not to miss this special ballet at the Yerba Buena Center for the Arts Theater in San Francisco. SF Opera, It's a Wonderful Life (11/20 - 12/9): A re-envisioning of Frank Capra's famous movie, George Bailey is a business man who thinks his life isn't worth living anymore. Clara, who is a angel trying to earn her wings, has the chance to save him and show him what life would have been like if he had never been born. Perfectly set during the holiday season with amazing singing, dancing, and sets, this is a must see if you are a fan of the movie. This show is approximately 2 hours and 30 minutes with one intermission and a wonderful way to during your SF Bay Area Christmas time. Carols By Candlelight (12/9): SF Young Women's Chorus presents this annual concert at the intimate St. Pauls' Episcopal Church in Oakland. The world premiere of David Conte's The Harper Song will be performed as well as A Ceremony of Carols by Benjamin Britten. Christmas Revels, Ancient Celebration (12/8 - 12/16): The beautiful Scottish Rite Theater in Oakland is home to the Ancient Mysteries of Andalusian Spain performance. Using dance, poetry, dance and more, the Revels tell the story of a young Moorish woman, a Castillian maid, and a Sephardic Jew who are all on a pilgrimage to help people of all religions live in peace and harmony. San Francisco Choral Society (11/30 - 12/1): The 135-person chorus perform the first three of the Christmas Oratorios accompanied by the Jubilate Orchestra. Based on the gospels of Luke and Matthew, J.S. Bach allows audience members to experience the birth of Christ while enjoying the wonderful St. Ignatius Church. Ring in this holiday season with some ice skating around the bay area. I've created a list of the 11 best outdoor ice rinks for you to enjoy and experience depending on whether you are in the North Bay, East Bay, South Bay or anywhere in the SF Bay Area during Christmas time. Union Square Tree Lighting (11/23): Starting at 5:30 pm, Macy's annual tree lighting is a favorite of locals and tourists alike. This event is much more than just a Christmas tree lighting as it includes live performances by the Oakland Interfaith Gospel Choir, The San Francisco Boys Chorus, and others. Santa will be on-hand to light the tree at 6:50 pm. Jack London Square Tree Lighting Ceremony (11/20): The Oakland waterfront is the site for this annual event which has a 55 foot tree with over 5,000 lights and more than 600 ornaments on it. You will be entertained by local musicians, check out pop-up shops, and be able to meet Santa as he gets ready to ring in the SF Bay Area Christmas season. This holiday event starts at 5 pm and ends at 8 pm. Broadway Plaza, Walnut Creek (11/29): For those visitors that are in the East Bay, the Broadway Plaza's annual Holiday Parade of Lights is a perfect way to usher in the Christmas season. Students from the Performing Academy will start at 6 pm. The parade starts at 7 pm with Santa coming along to light the tree. You are welcome to stay afterwards and stroll and enjoy the festivities. The Holiday Parade of Lights starts at 6 pm and ends at 9 pm. Christmas in the Park in San Jose (11/23-12/25): Held the day after Thanksgiving, this tree lighting is located in downtown San Jose's Plaza de Cesar Chavez. Santa will arrive and light the tree as part of this event. You can then enjoy the park through December 25. Alameda Tree Lighting Ceremony (12/8): Located at the Alameda City Hall, this tree lighting and celebration includes live entertainment by the Oakland Youth Choir, Alameda Community Band, The Dancing Christmas Trees, and many more. Some of the activities that kids of all ages include candy canes for kids and a visit for Santa Claus. Live entertainment starts at 4:30 pm and the tree lighting ceremony begins at 5:30. Emeryville (12/7): One of the other SF Bay Area holiday parade and tree lighting ceremonies is at the Emeryville City Hall. The parade starts at 5:30 pm and the tree lighting begins at 6 pm. There will be live music, dancing elves, and a visit from the North Pole by Santa Claus. Sunnyvale Holiday Tree Lighting (12/1): This family friendly event in the South Bay city of Sunnyvale will give everyone the Christmas spirit and a chance to take a photo with Santa Claus. The entertainment starts at 5 pm and goes until 7:30 pm. All activities are on Historic Murphy Avenue in downtown Sunnyvale. Winterfest at Great America (11/12 - 12/31): California's Great America in Sunnyvale is the home to one of the largest winter festivals in the SF Bay Area. With loads of rides for kids of all ages, giant toy soldiers, and featuring over 7 million LED lights, this event is sure to amaze everyone in your family. This event starts at 5 pm and ends at 10 pm. Find tickets to most dates for a discount on Goldstar. Alameda Lantern Light Festival: This is one of a kind SF Bay Area Christmas event is located at the Alameda County Fairgrounds and focuses on the traditional Chinese lantern festival but is updated for today's time. Each huge lantern takes over 4 weeks to build with a team of at least 7 people. Each lantern are handmade from cloth and look like 3-D stained glass pieces of art. This is definitely a must see if you are in the East Bay. Los Gatos Fantasy of Lights (12/1 - 12/2): The annual Fantasy of Lights gives you the chance to walk through a park full of music, food trucks, photo booths, and of course Santa Claus! Both nights of this event start at 4 pm and run until 9 pm. Everyone attending this event must buy a ticket including kids of any age. Winterfest Sausalito (12/8 - 12/9): The gorgeous Marin county city of Sausalito is home to the beloved Lighted Boat Parade and Fireworks extravaganza. This SF Bay Area Christmas will let you see the magical lighted boat parade on Saturday night, and you can visit a special after party. If you are in the mood for a little exercise, then do a 5k run on Sunday followed by a special brunch. The boat parade starts at 6 pm with fireworks at 7:15 on Saturday night. The Jingle Bell 5K run starts at 8:30 am with the kids fun run starting at 9:15 am. Decemberfest, Craft Beer Night at the Guardsman Tree Lot (11/30): If some adult libations are more your thing during this SF Bay Area Christmas, then this will be the celebration for you. Located at San Francisco's beautiful Fort Mason, you will be able to taste some of the best local brews while also sampling delicious German food including bratwurst and delectables. This beerfest starts at 6 pm and ends at 10 pm. Mill Valley Maker's Market (12/8): Over thirty local artists display their wares while musicians play music as you enjoy walking around the Mill Valley Lumber Yard. You can just look at all the beautiful pieces of art such as glassware, ceramics, jewelry and more, or you can purchase some if you like. This festival starts at 10 am and ends at 5 pm. SF Made Holiday Fair (12/16): The California College of the Arts in San Francisco is home to the this event which is home to over 60 vendors from the SF Bay Area. You will be able to purchase all your holiday gifts including toys, holiday cards, jewelry, decorations, and much more. The Holiday Fair starts at 11 am and finishes at 5 pm. Santana Row Holiday Maker's Market (12/1): If you are in the south SF Bay Area during the holiday season, then this is the perfect event to get all your holiday shopping done in just one day. Located at the gorgeous Santana Row Park with over 30 local artists and their wares, you will also enjoy live music and complimentary wine and small bites. This event beings at 10 am and will end at 6 pm. Los Gatos Maker's Market (12/8): Another of the south bay's craft fairs is located in Los Gatos. You will enjoy the small town feeling of the Old Town Center while shopping at event featuring over 20 local artists selling children's clothes, artwork, jewelry and more. The Maker's Market starts at noon and will continue through to 6 pm. Saint Lawrence Holiday Market (12/9): Get ready to shop until you drop at this event as you can find pop-up shops, delicious drinks, foods, and take photos with Santa during your time here. Kids of all ages will enjoy this wonderful market starting at 9 am and ending at 3 pm located in the south SF Bay Area city of Santa Clara. San Jose Holiday Craft Fair (12/15 - 12/16): This fair celebrates Christmas by giving you a chance to buy all your holiday gift,s while enjoying lots of free special events and handcrafted arts that everyone in your family will enjoy. This two day fair starts at 11 am and ends at 5 pm both Saturday and Sunday. In addition to the tree lighting ceremonies and the Christmas festivals mentioned above, here are a few additional places to see Santa this season. Macy's in Union Square (11/23 - 12/24): One of the SF Bay Area Christmas best locations to meet Santa is at the wonderful Union Square in downtown San Francisco. Note: You must reserve a spot from 30 minutes to a maximum of 5 days in advance as Santa is so popular at this event. Follow the link below to make your reservations, so you don't miss out! Broadway Plaza, Walnut Creek (11/16 - 12/24): Santa welcomes you to the cute city of Walnut Creek in the East Bay. Make sure to get your photo with Santa as you enjoy this Christmas celebration. There are also special events, so make sure to check the link below. You can also have breakfast with him on each Sunday on 12/9, 12/22, and 12/23 from 9 am to 11 pm. Holidays on Fourth in Berkeley (11/16 - 12/23): The city of Berkeley welcomes you to celebrate this holiday season with special events such as Santa's Forest, the Maker's Row festival, the Fratello Marionette show and many more exciting exhibitions for your whole family. Check the calendar below to find which is just right for you. 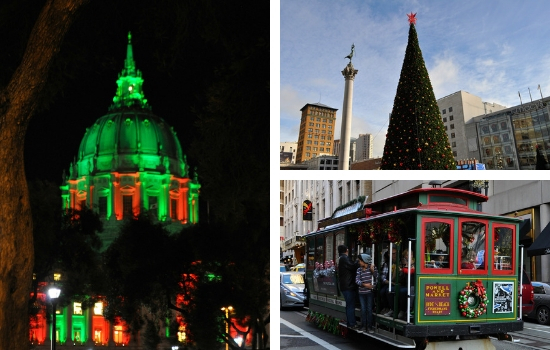 You will find plenty of places to celebrate your SF Bay Area Christmas. Here are just a few places open this Christmas Eve for dinner. You can either book directly with the restaurant or visit OpenTable.com. Cliff House: All three restaurants at the Cliff House are open regular hours for Christmas Eve. Book your reservation on their site. Attractions: Most attractions around the SF Bay Area are open on Christmas Eve. Many close a little early to celebrate the holidays. Here's a schedule for top attractions around SF, so you can see what closes early. Cirque du Soleil: There is one performance of Cirque du Soleil's Volta on Christmas Eve in San Francisco. Oakland Raiders Football Game: The Oakland Raiders take on the Denver Broncos at 5:15pm on Christmas Eve. The game is at the Oakland Coliseum. Smuin's The Christmas Ballet: The Yerba Buena Gardens is where you will find a performance of Smuin's The Christmas Ballet this Christmas Eve in the SF Bay Area. The show starts at noon. Find tickets at a discount for this performance on Goldstar. Red, White & Green Festive Cruise: Leaves from Fisherman's Wharf at 4:15pm on Christmas Eve, find tickets at a discount on Goldstar. Nutcracker Ballet: You can catch a performance of the Nutcracker Ballet in either San Francisco or San Jose on Christmas Eve. Several places around the SF Bay are open for Christmas Day. Here are just a few recommendations based on location. Cliff House: All three restaurants are open on Christmas Day. Sutro's: Open from 11am to 9:30pm, serving Christmas meal and reservations are required. The Bistro: First come, first served, open for lunch from 9:30am to 1:30pm and a special Christmas meal from 2:30pm to 9:30pm. Arrive early to get your name on their waiting list. Terrace Room Champagne Buffet: 4 two hour seatings available between 10:30am and 6:30pm. The SF Bay Area Christmas fun extends out to the holiday too. You will find plenty of fun things to do all day long. Here are just a few of my top picks. California Academy of Sciences: This popular museum in Golden Gate Park is now open 365 days a year. You can stop by for a full day of fun. Catch a show at the planetarium, say hi to Claude (their rare white allegator), stroll around their four-story rainforest, and check out their huge aquarium. Find skip the line tickets for Christmas Day. Muir Woods: This National Park is open all year long also. You can either drive up to Muir Woods on your own (make sure to reserve a place to park) or take a guided tour. Find details on taking a guided tour to the park on Christmas Day. San Francisco Zoo: The SF Zoo is the only Bay Area zoo open on Christmas Day. Their regular hours for this day are 10am to 4pm. Pick up your tickets in advance from their site. 7D Experience: Head over to Pier 39 to spend some time fighting off the bad guys at the 7D Experience. This fun activity is part movie, part video game and a whole lot of fun! Pick up advanced tickets. Golden State Warriors Basketball: The Golden State Warriors take on the Los Angeles Lakers this Christmas Day in Oakland. Watch Kevin Durrant, Steph Curry, and the team take on LeBron James at the Oracle Arena at 5pm.